The Northern Incentives Program is comprised of non-pensionable allowances tailored uniquely to employees whose work sites fall within specific geographic areas in Northern Alberta. The allowances are separate and non-cumulative, and are provided to all employees, including those working with AHS on a temporary basis, as shown below. Full-time Employees: $6,300 annually, payable on an hourly basis for all hours paid at basic rate of pay. Part-time and Casual Employees: A maximum of $6,300 annually, payable on an hourly basis and prorated by hours paid at basic rate of pay. Full-time Employees: $3,000 annually, payable on an hourly basis for all hours paid at basic rate of pay. Part-time and Casual Employees: A maximum of $3,000 annually, payable on an hourly basis and prorated by hours paid at basic rate of pay. Full-time Employees: $12,480 annually, payable on an hourly basis for all hours paid at basic rate of pay. Part-time and Casual Employees: A maximum of $12,480 annually, payable on an hourly basis and prorated by hours paid at basic rate of pay. Permanent and temporary employees working in excess of one (1) year whose work sites are above the 57th parallel are also eligible to receive an annual reimbursement of personal travel expenses. Casual employees are not eligible to receive this reimbursement. This component of the program offers eligible employees reimbursement for the cost of one (1) round trip, per calendar year, to any destination within Alberta. 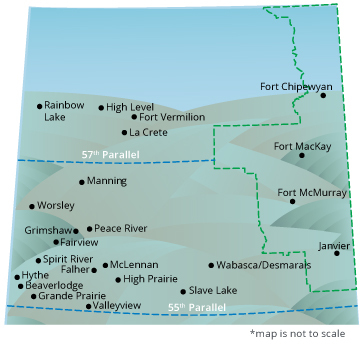 Travel must originate from a community above the 57th parallel to any destination within Alberta. The total reimbursement shall not exceed $1,235. If using a private vehicle, employees will be reimbursed at a rate of $0.165/kilometer. Reimbursement of travel expenses can not be carried over, and must be used each calendar year. Reimbursements of travel expenses are payable through the completion of a Northern Travel Reimbursement Form, and are considered a taxable benefit.